After coming up with a successful batch of mineral make-up, I decided to branch out into blush. It was really easy and works beautifully. I managed to get a great coral colour, and it stays on beautifully. It’s probably pretty obvious, but I am rather pleased with myself. I started with a recipe similar to that of the mineral make-up, but took a few cues from that experience and a few recipes for other mineral make-ups and eyeshadows I’ve seen. The first thing I did was ditch the titanium dioxide in favour of a bit more zinc oxide and some silk peptite (a new ingredient for me). I have nothing against titanium dioxide, but the version I have is non-micronized, and ended up as the largest particle in my mineral make-up by a fairly large margin. Next up, I decided to add some clay. I have green and red French clay… I chose the red one for rather obvious reasons. It’s a beautiful russet tone, and once I combined it with all the different white powders I had something very close to the colour of the mineral make-up. I then took it the rest of the way to pink with red iron oxide. After those modifications, the process was very similar to making mineral make-up. Mix together everything but the oxides, press the mixture through a fine sieve, and then start slowly adding the oxide. I used a 1/8 tsp measure to add. Mix together the first five ingredients in a metal bowl. 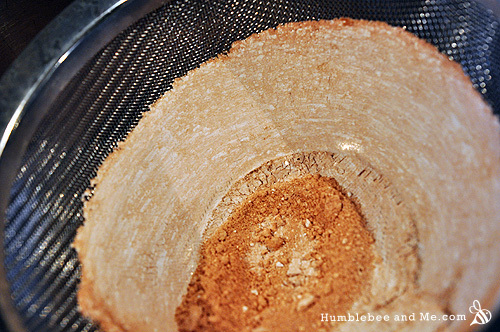 Pass through a fine sieve into another bowl, pressing through with the back of a spoon to break up the clumps. Pass back and forth, pressing and smashing until you don’t notice white streaks anymore as you mash the mixture through the sieve. Add the oils, stir, and then press through the sieve, passing back and forth until the mixture is uniform again. 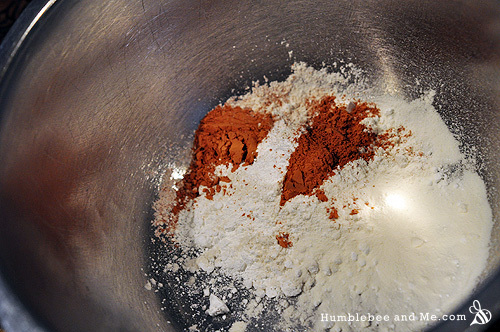 Begin adding the oxide, 1/8th of a teaspoon at a time, passing back and forth through the sieve after each addition. Test the mixture between each addition (brush some onto your cheek or inner arm with a blush brush for a realistic test) to check the colour. 3/4 of a teaspoon ended up being right for me, but it might not be for you. You’re definitely going to want to make this in a coffee grinder that you only use for DIY projects. It’s the only way to get an even, thorough colour blend, plus it’s way faster! Just make sure you wear a dust mask so you don’t inhale the powders after whipping them up—that can be dangerous to your health over the long term. Check out my book, Make it Up, for a better formula that uses fewer ingredients and is much more flexible. My book also has lots of colour blending tips and a few different starter colour blends so you can create a wide variety of different shades of blush. Hello! Just wondering where you get your products from? I usually buy from Mountain Rose Herbs, but just wondering where you source yours! 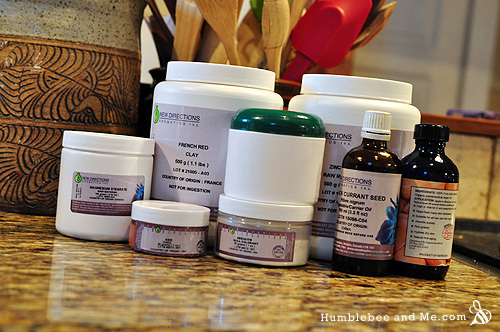 I order almost everything from New Directions Aromatics (http://www.newdirectionsaromatics.ca). Their prices are awesome and they have a great selection! Would using a mortar and pestle on the ingredients that are coarser tha the others be of any help? With your experience, would you use the silk peptite and zinc oxide in the face powder for at least part of it instead of all titanium dioxide? Thanks, very interesting! I just may try it. I’d actually recommend a coffee grinder over a mortar and pestle. Shortly after I made the blush and mineral make-up I went out to Value Village and bought myself a $5 coffee grinder. I blitzed both the mineral make-up and blush, and it really helped the texture, more than any amount of pressing through a sieve or grinding in a mortar and pestle could, especially considering how quickly the coffee grinder works. Titanium dioxide is more opaque than a mix of zinc oxide and silk peptide; that’s why I’ve chosen titanium dioxide for the mineral make-up, where coverage and opacity is key. 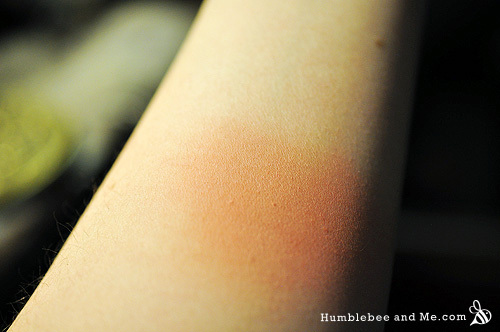 The zinc oxide and silk peptide are a better combo for the blush, where you don’t need opacity as much. 50g of zinc oxide and sericite mica will be more than enough. 5g of silk powder and magnesium stearate would do it, and 20g of clay. That said, you generally can’t buy these ingredients in such small quantities so I would recommend just buying the smallest size they sell. You can use most of these ingredients to make mineral make-up and other cosmetics, so it won’t be a waste. I just made it. It’s just an amazing color for all skin types. As this is quite a big amount do you have any suggestion of turning it compact instead of mineral.. I like also the cream blush but I have really a very oily skin ! Any suggestion also to turn it cream without being oily ? Fantastic! 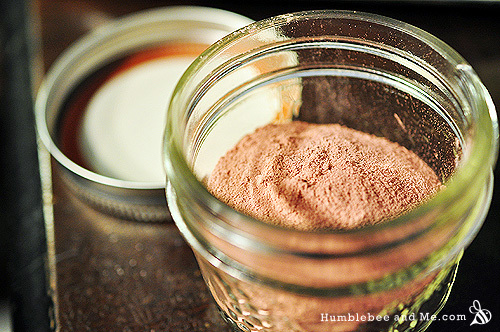 You should be able to press the powder down into the container fairly easily with a wide, flat-bottomed thing, like a smaller jar. It has enough moisture in it that it will hold together relatively well (though not as well as a store bought pressed powder). I have tried the rubbing alcohol paste method, but I’ve found this adversely effects the make-up, so I don’t recommend it. Thanks for reading & DIYing with me! Could more red clay be substituted for the red oxide with similar results? I’m new to mineral makeup but have a vast collection of colored clays. I love this site so much! Thanks for sharing! dear Marie, I’ve been following you for some time and I purchased your book (I pre-ordered it as soon as I found out about it). Just placed an order yesterday for the necessary ingredients to start off making my own makeup. I’m so excited, I can’t wait to do this ! just a quick question, ’cause it wasn’t so clear to me in the pages that I’ve read so far. I ordered a set of mini measuring spoons (drop, smidgen, pinch, dash and tad) but I still don’t know how am I to measure 3/128 tsp for one of the blushes that I want to prepare. I understand that the drop spoon can be used to measure 1/64 tsp. So I should use half of that spoon to measure 1/128? is that how I should try and do this? please help when you have a minute. Appreciate it a lot. PS LOVE your website and what you do, you’re amazing ! !